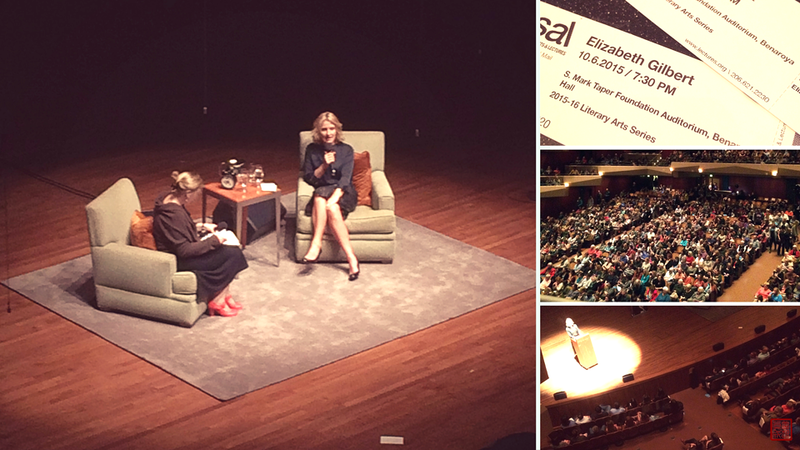 This Tuesday, we went to listen to best-selling author Elizabeth Gilbert speak about her latest book, “Big Magic” at the opening session of Seattle Arts and Lecture’s 2015 season. We were lucky enough to get tickets, and be 2 of the 2,500 sold-out crowd at Seattle’s Benaroya Hall. In addition to being in awe of how an author sold out an opening night (a rare incident! ), we were deeply inspired by Elizabeth Gilbert’s message of courage, passion, and creativity. We laughed with her, we Amen-ed at her (very many) eloquent wisdom, and we awwww-ed at the humanity she highlighted in everyone. There were many moments in the evening when something she shared struck a chord – deep within. In those moments, we tapped into a Universal shared wisdom. 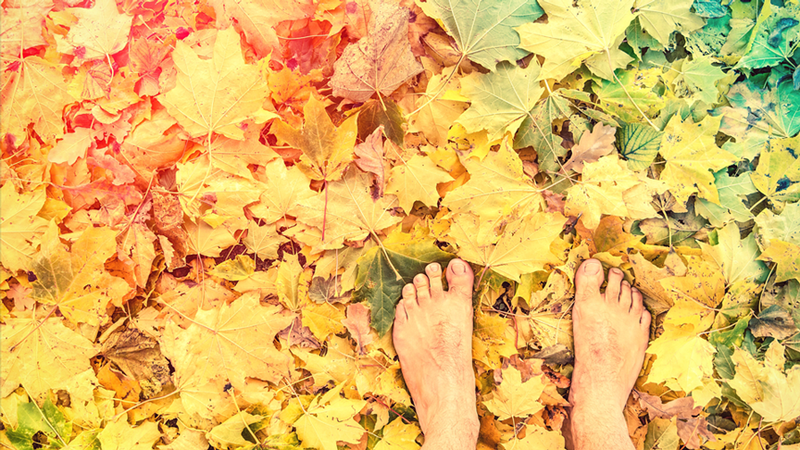 Like we knew it all along; and Elizabeth Gilbert was there to remind us what we’ve forgotten. We didn’t want the night to end. We wanted to remember the reminders. We wanted to share #BigMagic with our tribe. And so after we’ve had time to integrate her words, the crowd’s reaction, and our experience; we sat down and let the words bubbled up from that deep place within. 1) Fear is on your side. Work with it and create a different outcome. We cannot have a discussion about Creativity without talking about its twin, Fear. Because Fear wants to protect us, it does everything it can to steer us away from situations with uncertain outcomes. Whether we like it or not, Fear is omnipresent. And it’s gonna be with you like – forever. Heck, it’s in our DNA! So instead of fighting Fear (because whatever you resist, persists), you might as well invite it along for the ride. In this case, the invitation came in the form of a welcoming speech addressed to Fear; which Elizabeth Gilbert reads aloud to Fear every time before she embarks on a project. Not coincidentally, we had an in-depth discussion of Fear VS Intuition at a luncheon with fellow Wisdompreneurs in Seattle last week. There was plenty of charge in discussing fears. Afterall, it’s the second strongest emotion in the human species. When it was our turn to comment, something in us urged us to share that Fear is a tool used by Intuition. And by listening, we don’t mean obeying its primal fight or flight instincts. But rather, tuning in to what Fear has to say. Like Elizabeth Gilbert, invite Fear to join you. Give it a seat. Essentially, Fear is on our side. It wants to help us. If you don’t like how it’s doing its job (like Liz Gilbert: “Apparently your job is to induce complete panic whenever I’m about to do anything interesting.”), address it. Come up with an empowering way for it to serve you. Create together, a different outcome this time round. So state your why and claim your existence. We love a bad rep being redeemed. In this case, Elizabeth was appropriating the millennial badass, “Entitlement” and putting it to good use. This entitlement, she said, is the only weapon we have to battle the creative terrorist who lives inside our minds. We could almost feel every single person in the auditorium sucking in their breath, as if we’ve all been punched in our bellies. The question had hit a nerve. If we let it, the creative terrorist will come up with destructive, demeaning, and deprecating thoughts to bind creativity like a hostage. Elizabeth Gilbert told us, “Strip the question of its tone.” And it simply becomes a question. Claim the existence you’re entitled to. And then listen. Listen for a better question. Because it’s not so much about who are you to do what you do; but rather, why do you do what you do. 3) Sometimes you have to sacrifice the good. Make room for the GREAT. She then went on to talk about how most people lead good lives. We fill our time with good things – the right things, the responsible things, the routine must-be-done things. Then we forget about the GREAT things. The things that make our souls ignite. That make our eyes sparkle and our hearts sing. The things that we’re immensely grateful and excited that we get to do. And she asked us to make room for GREATness in our lives. 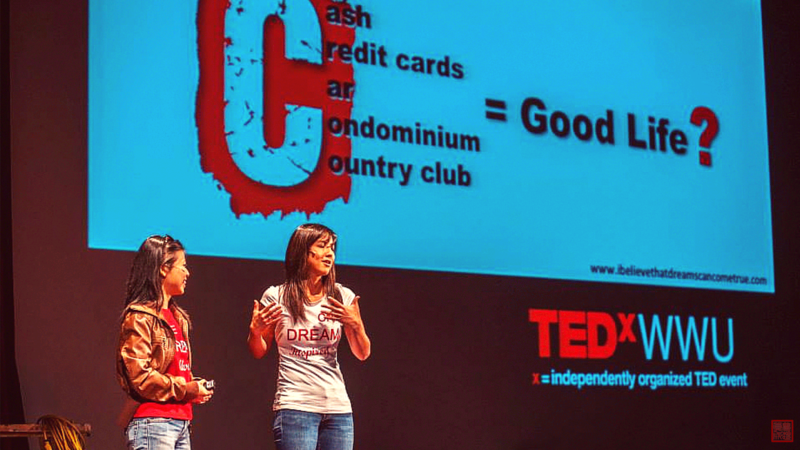 We shared something similar in our TEDxWWU talk. We talked about the “right” path so many of us are goaded towards because we want safety, we want acceptance, we want to be good. Where we came from in Singapore, good comes from the Chase for the 5Cs. In this hard-work chase to be good, we gave up the GREAT. It’s human nature to be good. There’s absolutely nothing wrong with good. In fact, good’s… well, good. And sometimes you have to sacrifice the good; and make room for the GREAT. 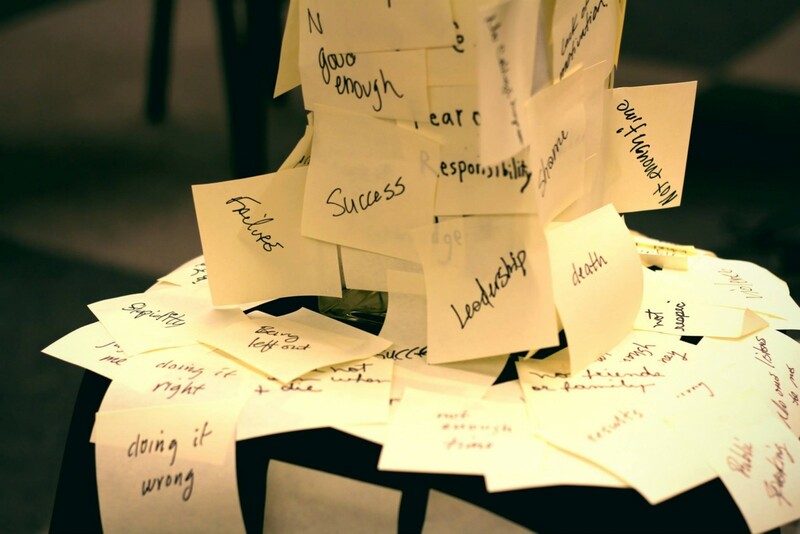 List down your GREAT things. Pick one and do it today. In fact, do 1 GREAT thing a day. Were you there at the talk? Have you read Big Magic? What were your take-aways, your aha-moments? 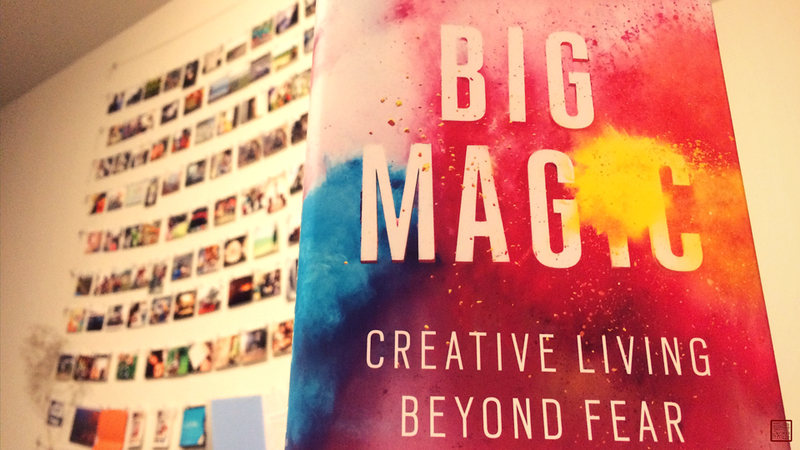 Leave a comment below and share your #BigMagic experience. Share with us: What was one follow-up action you took and what were your results/realizations? Share this article on social media and tell your friends: What was one follow-up action you found most useful and why? Tag us @taynval; we’d love to connect on social media, too!